On Oct 12, 2018, Xilinx and Huawei announced the First FPGA Cloud-based Real-time Video Streaming Solution in China. We celebrated this news Algodone style – eating a hearty lunch at Eugène et Marin with a glass of Chateau Margaux. Why? Because Algodone’s SALT Meter solution is part of this success story. The full story starts with the fast-growing video streaming demand in China. China, with its 1.4 billion population and 751 million internet users, is the largest market for online video streaming. In recent years, more and more consumers are subscribing and paying for online video content, such as movies and TV shows. IHS estimated that Chinese online video market could grow to $15.2 Billion in year 2020. In addition, live streaming industry is also booming. According to digital brand researcher L2, 100 million viewers watch a live online video event every month. The fast-growing video streaming demand puts a strain on the underlying infrastructure and technologies. Traditionally, cloud-based GPU platforms are used as the backbone technology. With this announcement, Huawei is offering an alternative solution leveraging Xilinx FPGAs running on NGCodec’s HEVC codec. The combined solution offers 35-45 percent lower bitrate at the same visual quality. This reduction delivers a massive improvement in bandwidth and storage costs. However, this is not yet the end of the story. As discussed in our early blog, “The Real Case of Silicon-as-a-Service, A Tale of 3 Innovators”, there are two other critical players at work that made this story complete. NGCodec is not only an innovator in video encoding technology, it is also an innovator in business model. Instead of selling its advanced technology as a product, NGCodec licenses and sells its technology usage (accelerated on FPGAs) and bills customers based on volume of data processed through their video encoder rather than time. For that, it needs a platform that allows NGCodec to easily deploy and manage its video encoding products in the cloud (Public, Private, On-premise, or any mixture of the flavor). This is where Accelize and Algodone come in. Accelize’s Digital Right Management (DRM) platform, built on top of Alogodone’s Silicon Activation Licensing Technology (SALT™), allows NGCodec to securely address the need for as-a-service purchasing model from their customers without having to worry about managing the logistics in complex, hybrid multi-cloud environments. Algodone’s SALT, through its innovative silicon-based licensing scheme, plays the critical role of protecting NGCodec’s video encoding IP’s from illegitimate usage and at the same time metering data volume processed for legitimate use. 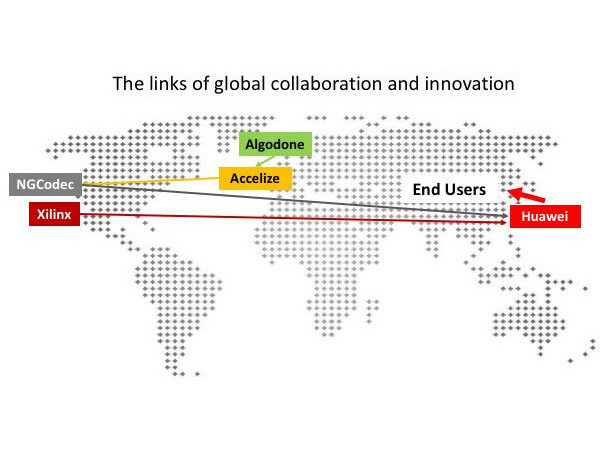 From Algodone, to Accelize, to NGCodec, to Xilinx, to Huawei, and all the way to Chinese video streaming consumers, the links are long and global. Yet the shared goal is the same -allowing best video streaming experiences for end consumers. We are proud to be part of the solution that makes it possible.